Here I want to show path to revise and understand solomonic pentacles. If somebody want to test talisman (pictures at the end of this post), pls, write about your results here. The main source of Pentacles in Western Tradition - books, known collectively as a "Key of Solomon". The modern reader who is familiar with Western magic, texts "Clavicules" known mostly from the works of Papus and McGregor Mathers. The latter belongs to, it seems, the first compilatory edition of "Greater Key of Solomon", for which he used several manuscripts. 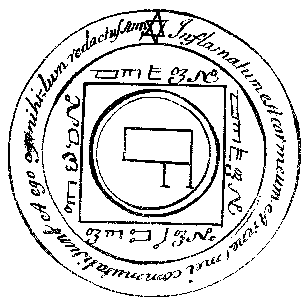 Mathers also to be commended not only for the publication of books, but also for trying to understand the many distortions in the inscriptions, formulas and images of Pentacles. But there are those, of which he wrote that does not know and does not understand what is depicted there. And as you know, that's incomprehensible is usually the most interesting and effective. One of these relates to the pentacles of Venus (Figure 43 in this volume), and the description is able to arouse love in any particular: "When it is only showed unto any person soever, it inciteth and exciteth wonderfully unto Love." So great Mathers could not decipher these names, but we will make an attempt to reconstruct the talisman, because, in our disposal there is a greater number of available manuscripts and images. And this is a quote from another Psalm – 72, 21: Quia inflammatum est cor meum, et renes mei commutati sunt. Thus my heart was grieved, and I was pricked in my reins. So foolish was I, and ignorant: I was as a beast before thee (Ps.73, 21-22 of KJB). This is clearly more suitable quote for words that define love with those feelings, which are supposed to be transferred to the object of love, as opposed to text Ps.21.15. Incidentally, with regard to the text of the words of power, according to the traditions of the Middle and Dark Ages quotations from the Vulgate (Latin Codex of Bible) are more preferable, because it is the sacred language used in the worship of the Western Church, whose priests were fathers of grimoires their selves. The central character – is a seal of Venus, which is composed with a kamea of Venus in manner not usually described from contemporary authors. 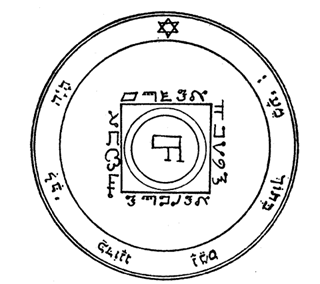 Seal is drawn by vertical and horizontal lines between the five points (the principle of the pentagram, and the secondary number of Planet relates to the human world, microcosm of cause). The Sum that gives the sigil of this form is equal to 13, ie Venus secondary number corresponding to the words of Ahaba - Love. This number is typical for one of the spelling of a name in Hebrew Venus (Nogah). Names that are arranged around the Seal in this kind of Pentacles formed based on certain rules, which are based on the numerical equivalent of the name (the number of the name). Firstly, the number of the Name should not be greater than the number of Seal. 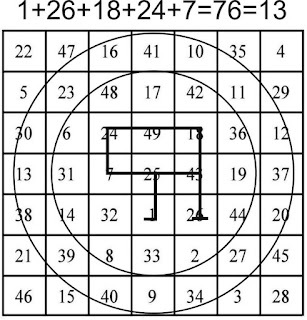 Secondly, the number of Names must form an equivalent or a spiral structure. 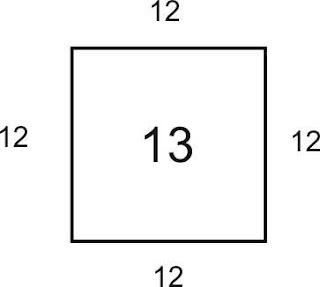 Equivalent structure implies that the number of each word to one or less coincides with the number of Seal. 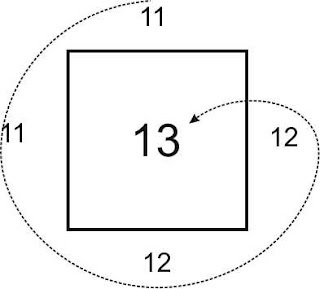 Spiral structure implies that the numbers go counterclockwise from the smallest to largest, leading to the center of the whole structure - the number of Seal. Inscriptions around our pentacle written with alphabet, which Agrippa called Transitus Fluvii (passing the river). El Gebil (bottom) - Aramaic origin. גביל means something that is mixed, collected together. Meaning of the verb גבי - collect, rake, purify, clean. El Gebil - a "God unites [by purification]." However, I have not find this Name nowhere else. At least, it is not known to us. Elohim (top) in this context is not the Name of God but the rank of angels corresponding to Sephira Netzach. This, of course, does not fit into the scheme of drawing before for this kind of Pentacles. It is possible that the author of this grimoire experimented with "reverse spiral." Other names in this example cannot be deciphered or restored, since there is an obvious combination of alphabets, possibly, the subsequent distortion of copyists. In the next example, characters and the names are similar, but the right word has been replaced by the Elohim. In contrast to the above instances, "Clavicules" which stored in the library of Leipzig, have images that are more readable.